This sleekly sophisticated hairstyle is excellent for daywear, and absolutely perfect for a formal evening event! Side-swept hair which plays ‘peek-a-boo’ around the face – alternately revealing and concealing – is always a glamorous look. In this style, the hair below the side parting is gently swept away from the face revealing the model’s fine profile, a prettily decorated earlobe and the nape of the neck. 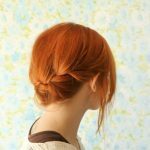 In a super-creative elaboration of the basic style, the hair is loosely braided along the back hairline in a diagonal French plait, which moves gracefully down to the opposite side. The final piece de resistance of this elegant braided hairstyle is the unexpected fishtail braid, which adds a beautifully-judged contrast with the smooth fringe and loosely draped side profile! Do you want to know how to style this Fishtail Side Braid? You can find out the Fishtail Side Braid tutorial in this exciting ebook 30 Braids in 30 Days. This cool hair style book has 80 pages of all tips, tricks, cheats and techniques at your fingertips. Inside you’ll also find the how-to instructions to the essential braids of this series such as the Waterfall braid hairstyles, Classic braids, Dutch braid hairstyle, French braids, Fishtail braid and the Hair Romance signature Twist & Pin technique. Check it out here. Do you love this beautiful fishtail side braid hairstyle? Here are more braided hairstyles and fishtail braid for you to choose from.